Lyn Lifshin is MOVING THRU STAINED GLASS! NightBallet Press is enormously pleased to present Lyn Lifshin's new book, Moving Thru Stained Glass—The Maple Poems! Moving Thru Stained Glass—The Maple Poems explores the sweet, sticky, and stunningly colorful world of the maple tree. Moving through the stained glass of "violet, amber, and rubies on flame", Lifshin explores the discovery of maple syrup by the Iroquois and Algonquins, taps into her own childhood memories, and follows the transformation of the seasons through "burnt copper" and "ice crystals" to the clanging of sap buckets and "sun-colored juice". 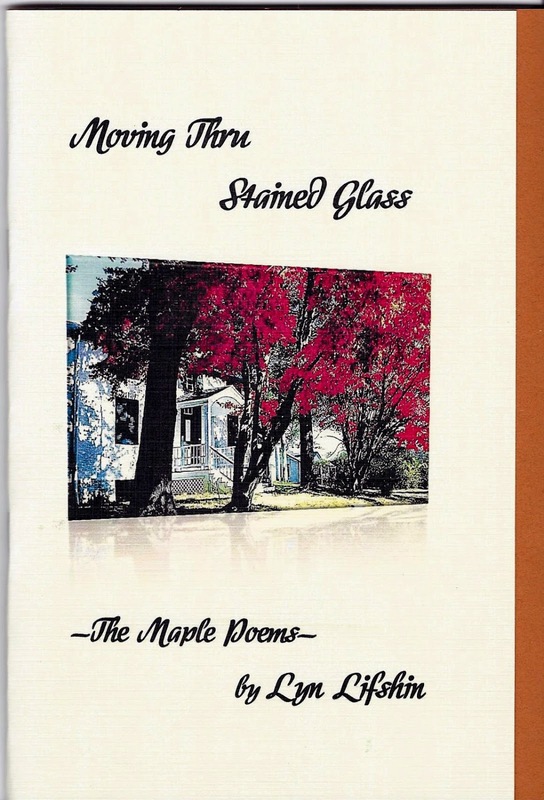 Moving Thru Stained Glass—The Maple Poems is 36 pages long, and features a beautifully-rendered cover photo—taken by New York poet George Wallace—printed on creamy-ivory cardstock. The cardstock insert is a warm burnt orange, and the text is printed on thick, textured, pale champagne-colored paper. The 27 poems are pure Lifshin, entrancing and transforming the reader as her thematic spell weaves its way through the pages. The legendary Lyn Lifshin has written more than 125 books and chapbooks; her poems have appeared in most of the poetry and literary magazines in the US. She won the Jack Kerouac Award for her book Kiss the Skin Off, and has been praised by Robert Frost, Ken Kesey, and Richard Eberhart. She is the subject of the award-winning documentary film Not Made of Glass. Recent books include Knife Edge and Absinthe—The Tango Poems (NBP) and Tangled as the Alphabet—The Istanbul Poems (NBP), A Girl Goes Into the Woods (NYQ Books), and Femme Eterna (Glass Lyre Press). Available now, Moving Thru Stained Glass—The Maple Poems is only $10 plus $3 shipping/handling, directly from NightBallet Press...just use this PayPal button to purchase! This book is also on Amazon! Join NightBallet Press as we move through the marvelous and magical stained glass world of the one and only Lyn Lifshin! Buy your copy of Moving Thru Stained Glass—The Maple Poems today!